Full circle moments are my favorite kind of moment, in the grand scheme of things. I live for those times when everything seems to connect, when it feels as though Fate is keeping a close watch on everything going on around us. One such moment led me to Ruby Warrington. Though I am not religious, spirituality is an important part of my journey. And along the way, I’ve come across several pieces from The Numinous, a platform in which “the New Age has got an image upgrade and become the Now Age.” I never put two and two together, realizing that Ruby is the site’s founder — until Latina Culture Writer Gabriela Herstik introduced us. Ruby and I met at one of my favorite L.A. cafes to discuss her new book, and I couldn’t get over the energy she exuded. She’s powerful and in control, yet warm and welcoming. I instantly wanted to give her a hug (and did) — and yes, it was pretty great. Following our meeting, I was sent off with a copy of Ruby’s book Material Girl, Mystical World and the feeling that I could do anything. Ruby’s confidence is contagious, and that’s exactly what you get when you open her book: a form of empowerment that’s relatable, one that makes you want to work toward being your best self. After I inhaled her book, Ruby agreed to answer any questions I had, and the following exchange transpired. Ruby Warrington: First, let me define “Now Age!” You know about the “new age,” right? Well, this refers to the Age of Aquarius, the astrological era we began transitioning into in the 1960s. Every 2,000 years or so, the whole planet comes under the influence of a different sign of the Zodiac, and during the first decade of the 21st Century is when we transitioned fully into the Age of Aquarius (some say 2012 was the actual tipping point). So, by my logic, this is also when the new age became the now age! This means we’re living in an era defined by the hallmarks of Aquarius — rapid development of technology, free sharing of information, futuristic innovations, revolution, and radical ideas. And so living in the Now Age means we also have access to anything and anyone right … NOW! This is amazing, but can also be quite overwhelming for our brains to process. Humans weren’t really designed to keep up! For me, engaging in new age practices — like astrology, yoga, meditation — helps my body process the sheer volume of information we have access to living in the Age of Aquarius / Now Age. HG: Within the first few paragraphs of your book, you mention your coven. What would your advice be to those who are having trouble finding their own coven? There are probably one or two people in your friendship group already who you feel more comfortable sharing with on a more emo level, so first up, I would suggest enlisting them (even if it’s only one person) in doing something witchy together — like doing each other’s tarot, or enacting a simple ritual. If these people are not already in your life, my Moon Club program is a ready-made coven you can join from anywhere in the world! We meet weekly for online New and Full Moon rituals, mentoring salons, and inspiring Q&As. Our private FB group is a place to connect with each other one-on-one, or to even arrange to meet IRL. HG: Is there a certain misconception about astrology you hope to banish? Perhaps with this book? RW: A lot of people think astrology is narcissistic, and only for people who are obsessed with themselves. To which I’m a bit like, duh! Of COURSE I want to know and understand myself better, since this is what helps me show up as a more effective human in the world — meaning that I focus on work that plays to my strengths and makes me feel alive, and I am more authentic in my relationships with others. I also try to make it clear in my book that astrology is not a tool for “predicting” future events, or for “blaming” our bad behavior on — two other common beliefs that give astrology a bad rep. Rather, I see it as a roadmap to help us navigate the twists and turns of our cosmic path, and a language of symbols that helps us to communicate with our soul. HG: Can you talk more about how tarot helped you find the positive in the negative (I’m thinking of the Death card here haha)? HG: What would you say is the most important lesson your spiritual journey has taught you when it comes to the Divine Feminine? RW: This is a HUGE subject, and the chapter in my book on the Divine Feminine still brings me to tears every time I read it. The big lesson / message for me is that identifying as a “spiritual being” is a “feminist” act — since it means acknowledging that we are connected to all other living beings (including our Mother Earth) by the spirit that lives in all of us. Choosing to live from this place, it becomes all of our responsibility to take care of each other, and to speak up for all the people in our human family who have been marginalized, victimized, and mistreated in any way. This, for me, is the essence of the Divine Feminine. HG: I love the concept of “original medicine” (or a unique gift that’s been given to us to heal the world). What would you say yours is? And how did you come to realize it? RW: I think my original medicine is storytelling — and specifically helping women tell their stories. It’s why I was drawn to journalism as a career, and over the years I have helped countless celebrities, models, designers, and more to tell their stories! But with the Numinous, and with my book, my work has really become about helping ALL WOMEN find their authentic voice, and the confidence to let the world know who they truly are, and what they truly need (i.e. to tell their stories). All the tools, philosophies, and practices I cover on my platform are essentially in service of this. HG: What are the Top 5 ways you’ve made self-love a part of your daily practice? ✨ Sleep — getting enough sleep (or not) is the #1 thing that affects my ability to know, accept. and forgive myself. If I know I’m not going to get my regular 8.5 hours for some reason, and I’m gonna be slow, or grouchy, or kind of pathetic as a result, I go heavy with the “forgiveness” part! ✨ Boundaries — getting really comfortable and clear about saying “no” to anything which is not in my highest good. No apologies. ✨ Sacred sisterhood — having women in my life who reflect back at me the woman I want to show up as in an ideal world (that is, authentic, intelligent, imperfect, and kind). ✨ Eating plant-based — not just because this has been THE key factor in healing ongoing digestive issues I had suffered since having an eating disorder in my teens, but because I have truly come to believe that harming animals / the planet (via animal agriculture, for example) is the same as harming myself. ✨ Pleasure — so much to say on this, but in brief: As women, we carry so much guilt and shame around giving ourselves physical pleasure, be that in the form of pizza, pampering, or sexual pleasure! But our bodies need to experience pleasure to feel fully alive, and I see it as an act of self-love to acknowledge this. HG: With fashion being an integral part of your narrative, is there a specific piece of clothing in your closet that you have a spiritual connection to? RW: My favorite vintage / second-hand pieces, for a couple of reasons. Firstly, pre-worn clothing always feels like it “found me” — versus that some brand singled me out as a customer and sold it to me. In this sense, these pieces feel like they have a life, or spirit, of their own. Secondly, since connecting to the idea of myself as a spiritual being (see Divine Feminine), I can no longer ignore the environmental impact of the mainstream fashion industry. HG: Did you incorporate any of your “Now Age” practices into your book-writing process? All of them, since the book is a guide to all these practices through the lens of my personal experience. Doing my research meant thoroughly walking the talk! In terms of the actual writing process: Daily meditation to help develop mental focus and clarity; daily movement (often yoga) to get me back into my body after hours on end engaging with my mental process; and a hard stop on consuming alcohol, to keep my spirit optimistic and thriving. Quitting booze is a WHOLE other part of my spiritual journey, which I touch on towards the end of this book, and investigate more deeply with my Club SÖDA NYC events. 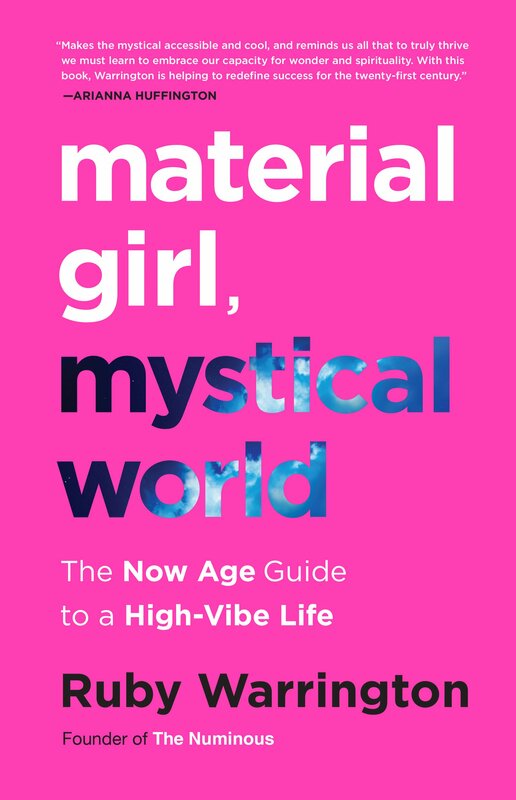 HG: What do you hope readers take away from Material Girl, Mystical World? RW: A really entertaining read, first and foremost! Part of my mission is to make “serious” topics like spirituality, self-love, divinity, and life purpose accessible and FUN. My soul has felt more excited and lit up by engaging with these practices than attending any fashion show, celebrity party, or boozy brunch. But also, I hope my readers feel inspired to begin a thorough investigation into what they are truly here to contribute to the world, and for the book to be a tool kit to help them go out and do it. HG: If you could offer one piece of advice to all the women who want to be doing what you’re doing, what would it be? RW: Just go for it! And don’t put pressure on your path for it to look a certain way. Women in particular can spend a lot of energy on trying to get things “perfect,” and in my experience this can delay you from just getting out there and telling your story (by which I mean stamping your unique imprint on the world). Yes, always do your absolute best. But also let go of some of the control and allow room for your journey to take whatever surprise detours have been cosmically designed for you. You can purchase Material Girl, Mystical World here.